Well, what do you know, if it isn't for the Samsung Galaxy Beam paying a visit to the FCC. The smartphone has just recently received the commission's seal of approval, meaning that it complies with all regulatory requirements. Interestingly, a thorough examination of the FCC filing reveals that the device has support for AT&T's 3G bands at 850MHz and 1900MHz. For those of you who don't remember, the Samsung Galaxy Beam is an Android smartphone with a killer feature, namely that it comes with a built-in pico projector. With an output of 15 lumens, it can project an image of up to 50 inches in diagonal right on your wall, which makes it an excellent multimedia device. In terms of hardware, there is a dual-core processor clocked at 1GHz ticking under its hood, and the WVGA display on its front measures 4 inches in diagonal. 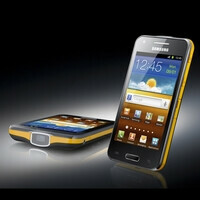 For more details, feel free to check out our Samsung Galaxy Beam preview. Of course, whether the Samsung Galaxy Beam will ever be launched on AT&T, or any other U.S. carrier, is still unknown, but here's to hoping. Verizon gets more phone choices than Sprint or T-Mobile. I can't tell whether the same can be said for them compared relatively to AT&T. The top two carriers have the most capital and the most volume to bargain with. VZW is the only one that gets all the Motorola phones. I'd love to have some of those Droids with QWERTY keyboards and metal cases on Sprint. VZW may not have gotten the Galaxy SIII but they got the Galaxy Nexus long before it became "yesterday's news today" on the other wireless carriers. The choice of SoC processor packages in the US is unfortunately coupled to the lack of LTE support on anything other than Qualcomm. It's a similar dilemma to that which occurred for Verizon and Sprint with CDMA chips and it is the reason Sprint initially resisted LTE in favor of WiMAX. More often than not, both Verizon and AT&T capitalize on the exclusive launch agreements which leave Sprint and T-Mobile in the cold for six months. I would have expected the Nexus line to be immune to it but that's not the case. Samsung has tried to resist the exclusivity agreements with the Galaxy S line but that isn't always perfect. I'm hopeful they'll give it a bigger push with the GalaxySIII. Having Samsung's newest flagship on all major carriers by the start of the London Olympic Games in August is a lofty goal and dare I say would be a major coup. Only Apple has gotten close to a simultaneous global launch on all carriers. The executive at Verizon that decides which phones to market sees all the potential phones 6 months to a year before they arrive so long before they are discussed here. 3D is a gimmick at least when it comes to these mobile devices. For it to work well, it needs to be immersive and that's not possible with these small screens and the relatively low data bandwidth.